A travel expense log is a very useful tool that can benefit many people from business owners, corporate travelers, to mothers planning family vacations. 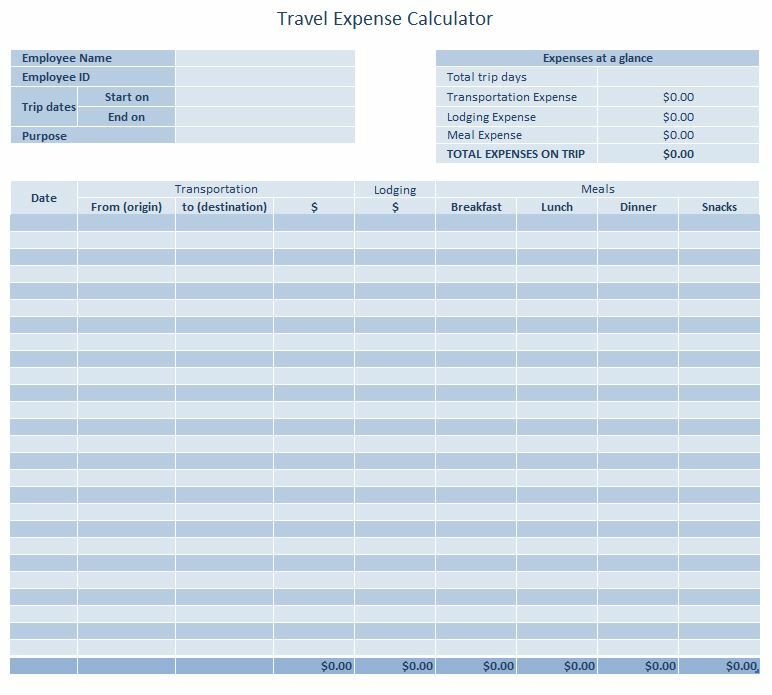 The travel expense log can help you save hundreds of dollars by keeping accurate records of every expense incurred or to be incurred. It is also a must have for all business owners and anyone who drives on the job because it is required by the IRS! Having a complete and accurate travel expense log can save the average business owner hundreds of dollars on their tax bill at the end of the year putting money back in your pocket. To get started first download the template FREE here on this site! Its easy-to-use and 100% customizable!! Next, fill in all of the company/personal information at the top. Be sure to include a full name, date, time and any other identifying information such as employee number. Also be sure to include the purpose of the trip. Then determine if there is a pre-established budget. If there is a budget, place that amount at the top of the log. When ready to start the trip enter the exact time you are starting. From that point on, enter in any expense incurred including gas, tolls, meals, lodging etc, and keep all receipts. At the end of the trip enter in the end time and add up all of the expenses. Be sure to write all information in blue/black ink or type. Before starting the trip, staple an envelope labeled “receipts” to the travel log to make it easier to keep track of all the receipts for that trip. When using for tax purposes, only include those expenses that directly relate to the trip and not personal things like shopping. Keep a file folder to store all completed travel expense logs for easy retrieval. If using for personal travel it’s still good to keep all of your logs in a file to review and compare how much you are actually spending on your vacations. Now that your all organized, relax and enjoy your trip!